Oh wait, this isn't Pac-Man at all, just an overly-complex free-to-play Puzzle & Dragons clone called Pac-Man Monsters, now available on Google Play and iOS. There's a lot of complaining about classic PC properties being perverted into mobile games these days, but what about poor Pac-Man? Save for the excellent Pac-Man Championship Edition games, most of his recent appearances have been in games completely unrelated to the original. As far as Puzzle & Dragons clones go, Pac-Man Monsters isn't bad. Instead of sliding gems about the screen, players trace paths through colored maze segments, powering up monsters of corresponding color in the process. That accumulated power is used to attack enemies appearing on the right side of the screen. It's pretty simple. The complexity kicks in when it comes to doing anything else on the extensive menu running down the left side of the screen. 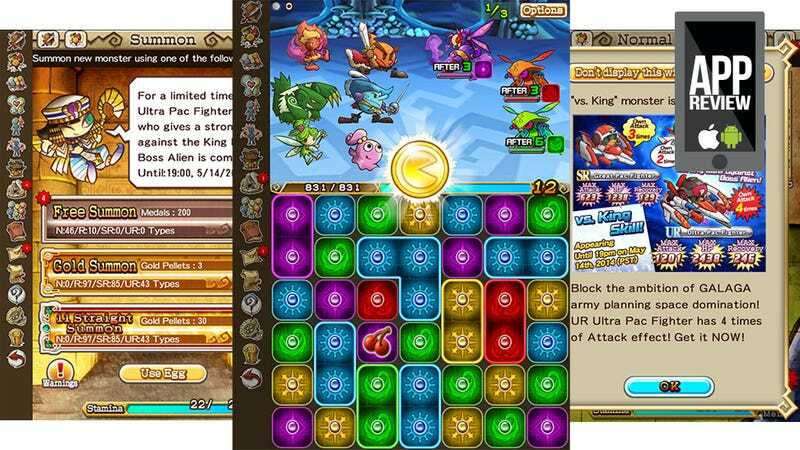 Evolving monsters, powering up your Pac-troops, using golden coins or something to unlock rare monsters, spending real cash on more chances to fill out your roster — standard for the genre, but with so many hoops and menus to jump through. The game shows me a treasure chest, then tells me to click on the chest to open it. Then I have to close the dialog telling me how to open a chest in order to open a chest. Sheesh. On the plus side, check out the sweet Galaga cross-over event! As a kid, the joy of Pac-Man was it was just me, the screen and a single joystick. It was pure and simple and wonderful. Pac-Man Monsters isn't any of those.